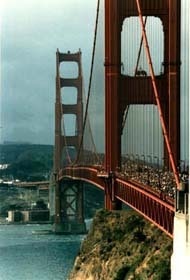 The 50th Anniversary of the opening of the Golden Gate Bridge was the day I almost died, twice. I’m thinking about it because today is the 75th Anniversary and I’m planning to go there, but not as a journalist, as I did the last time. This, I hope, is a safer way to celebrate. For the 50th, my friend and colleague Janet Wells and I were assigned to cover the event by our employer, The San Jose Mercury News. 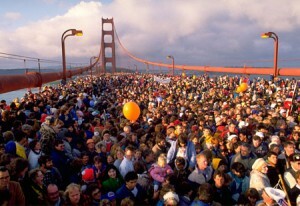 The bridge authority had predicted there would be 50,000 people on the bridge. 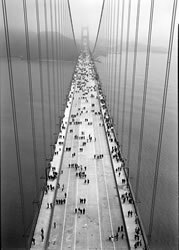 After all, when the bridge opened in the 1930s, only 30,000 people showed up, as this archive photo shows. We wanted to get there early. I agreed to meet her at her house in the Haight at 4 a.m. to catch one of the buses the city had provided to ferry people to the site as there was no parking. Bleary-eyed and clutching cups of coffee, we staggered toward a bus stop at edge of the Golden Gate Park panhandle to find hundreds of people jostling in the dark trying to muscle their way onto the packed buses. I don’t remember how we got to the entrance to the bridge, but as the crowd surged forward, Janet and I lost each other. That probably only took 30 seconds, but in an era before cell phones, I never saw Janet again until we filed our story. I’d never been in a mob before, nor experienced mob mentality. As we walked onto bridge, the mood was joyful. People wore costumes and furry hats, rode decorated bikes, all of us swept along in good feeling. Then suddenly I realized (probably along with many others) that I had no choice but to walk forward. If I stopped to tie my shoe, I might get trampled. Panic rose in me, a feeling that I had no free will and that there were terrible consequences if I stumbled. Just then, the crowd dissipated. At the center point of the bridge, there was open space. As the sun rose, I saw the army of revelers advancing on us from the North, the Marin contingent. Much as I wanted it, this was not a scene from West Side Story. No fist fights broke out between warring factions. We danced at the center of the bridge with all of the Bay Area gleaming in the beautiful spring sunlight. Much later, I met Janet at the press room, where we found out that we had been in another kind of danger at the center of the bridge. The bridge authority had woefully underestimated the crowd, off by a factor of 16 The weight of 800,000 people on the bridge had caused it to sag. People said the cables supporting the bridge were stretched as tight as harp strings. Engineers feared that the strain these bodies caused on the steel cables might damage the bridge, and also feared the panic that would ensue if they tried to clear it. Some later said that if we had been marching forward in unison, the heavy, coordinated footfalls hitting the bridge deck at the same time, it might have given way. 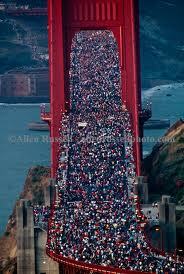 Fortunately, it’s difficult to get any one group of San Franciscans to do anything in unison. After we filed our story around 6 p.m., we hailed a cab heading to a party at the top of Russian Hill. I was exhausted. I rested my head on Janet’s shoulder and nodded off. At the edge of my consciousness, I head a rhythmic tapping that accelerated into a frantic pounding. I sat up straight. 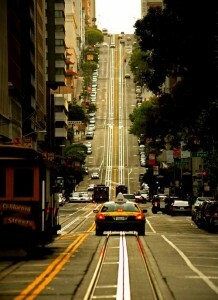 Janet and I looked at each other wild-eyed as the cab crested Taylor street, propelled off the road and into the air. “We’re gonna die,” Janet said quietly as I grabbed her hand. “We survived the bridge sag, and we’re going to eat it on a San Francisco hill,” I whispered under my breath. With some adept use of the emergency brake, the cabbie brought us safely to our destination. We tipped him heavily, and drank heavily at the party. The day that began at 4 a.m. ended the next day at 1 a.m. The bridge is closed to pedestrian traffic for today’s celebration. I guess they learned their lesson at the bridge authority. Now I truly enjoy aging. I have absolutely no memory of your scary day at the 50th GG Bridge celebration, and yet, I must have heard all about it at the time. So, I got to enjoy your story all over again. I expect this type of experience to increase in frequency and thus, enjoyment. Hilarious! Never underestimate the power of visualization, Danelle. Who knows what those marinites could have done, had you crossed their Karma in the wrong way? I, too, have been in one of these huge crowds where I had no control over my motion. Thought I might fall and get trampled. Frightening and there is little you can do about it.